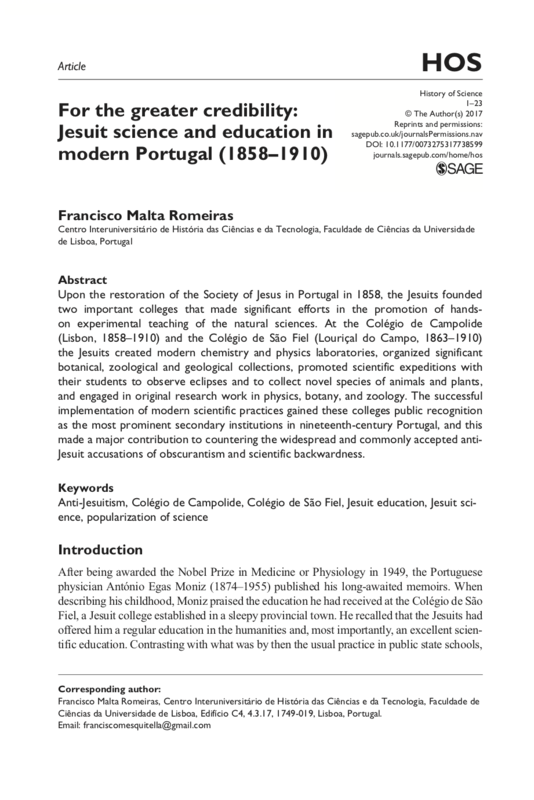 Upon the restoration of the Society of Jesus in Portugal in 1858, the Jesuits founded two important colleges that made significant efforts in the promotion of hands-on experimental teaching of the natural sciences. At the Colégio de Campolide (Lisbon, 1858–1910) and the Colégio de São Fiel (Louriçal do Campo, 1863–1910) the Jesuits created modern chemistry and physics laboratories, organized significant botanical, zoological and geological collections, promoted scientific expeditions with their students to observe eclipses and to collect novel species of animals and plants, and engaged in original research work in physics, botany, and zoology. The successful implementation of modern scientific practices gained these colleges public recognition as the most prominent secondary institutions in nineteenth-century Portugal, and this made a major contribution to countering the widespread and commonly accepted anti-Jesuit accusations of obscurantism and scientific backwardness.